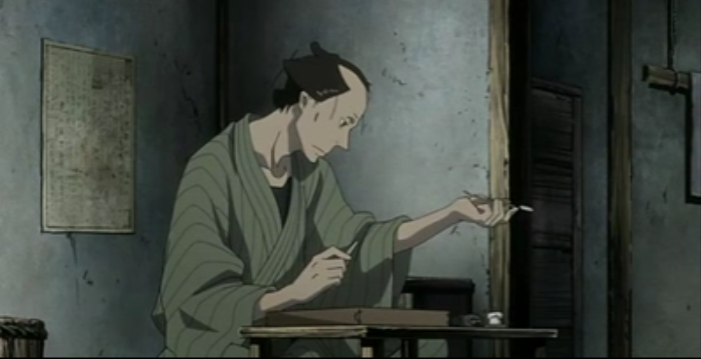 Matsukichi working one of his crafts. Matsu has shown himself to be an invaluable member of the Five Leaves gang. However he hasn’t revealed much personality, besides an apparent interest in Otake. In fact Matsu tries playing the loner in this episode, both when he declares his intention to never return to Ume’s place, and later when he gruffly tries to shoo off Masa who comes visiting with pickles. 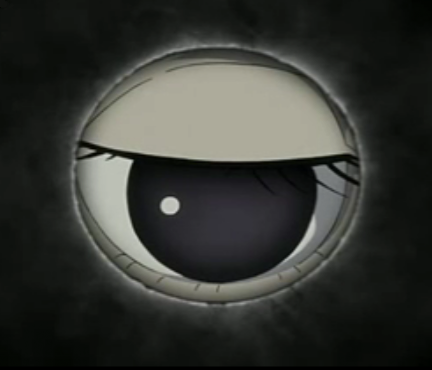 In a previous episode, Yaichi attributed this behavior to Matsukichi’s past as a lone robber. This time we get to see a few new sides of him. We get to see Matsu making jewelry in his workshop. We get to see him bringing money to an old man, to whom he owes a large debt. We also get to see him try to solve a problem on his own, with disastrous results. 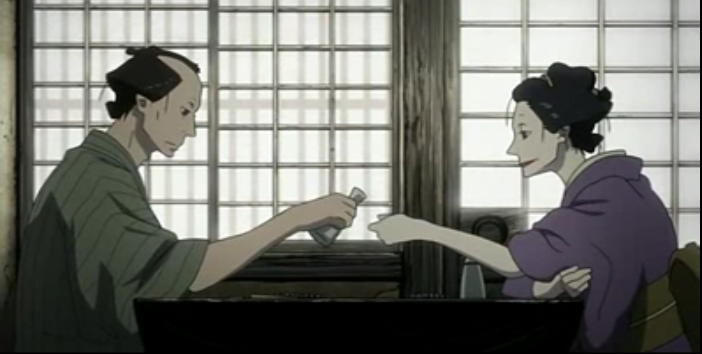 Matsu knows how to make Otake smile, give her some booze. Ume is making some fancy pickles. 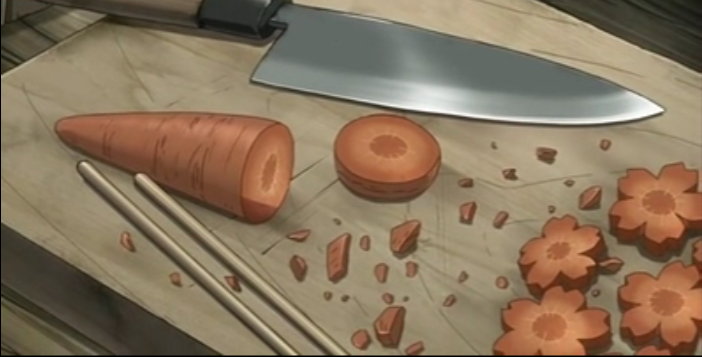 As an aside, there was a lot of food in this episode. In addition to the fancy carrots that can be seen being prepared above, Masa delivers pickles to Matsu, Otake is shown with a plate of pickled radishes (and a big bottle of sake) TWICE, someone tries to feed Matsu a rice ball, and Masa slurps noodle soup with Yagi. Masa and Yaichi have developed a comfortable friendship. 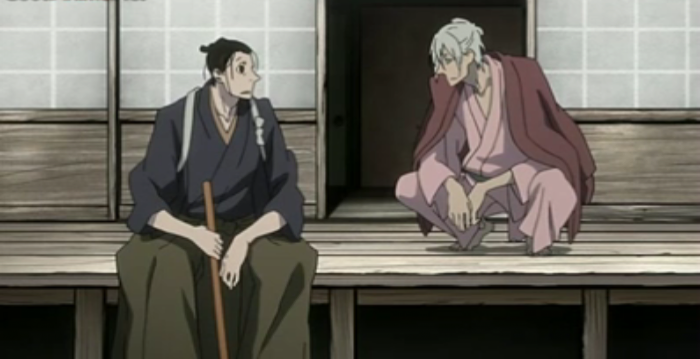 Yaichi also is a bit of a loner. We usually see him in a corner, sipping sake or puffing a pipe. With Masa he behaves differently. As can be seen by his body language in the screen-cap above, he is much more relaxed and open around Masa. Masa has openly stated his envy of Yaichi’s self-confidence. I think that Yaichi sees something in Masa that he admires as well. We get another hint of that in this episode when Yaichi responds to Ume’s begrudging acknowledgment that Matsu is a friend; Yaichi tells Ume that he’s cool for saying that. Matsu is captured and beaten. Meanwhile Matsukichi has gotten his self into a spot of trouble. The old man to whom he feels indebted is the master of the Kiku-ya candle making shop. Now when you think “candle”, what comes to mind? Romantic lighting? Pleasant smells? Meditation? In the old Edo depicted in House of Five Leaves, rival candle makers are warring. 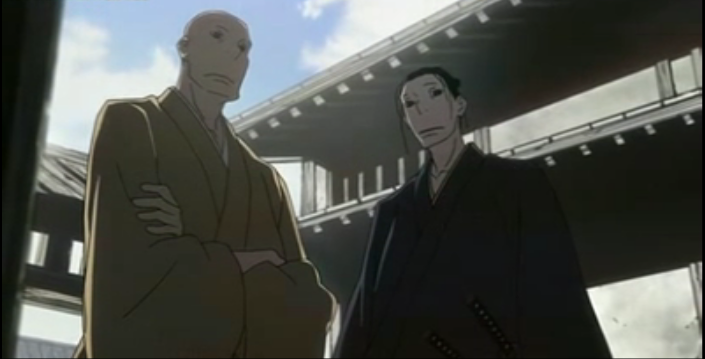 The rival of Matsu’s benefactor has stolen some official passes in hopes of humiliating Kiku-ya. 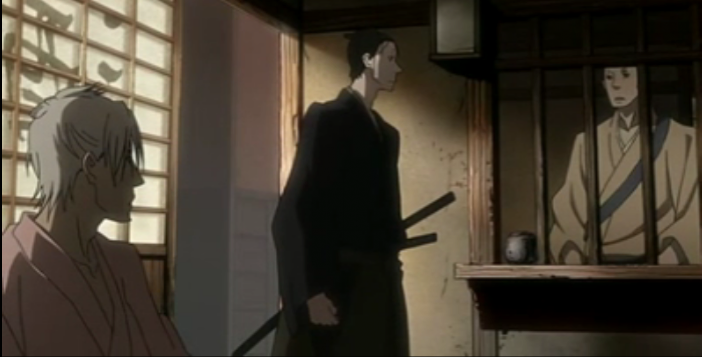 Despite being warned against it, Matsu sneaks into the rival candle shop, where he is captured by their resident samurai. Umezou and Masa: Stakeouts, interrogations, all they need now is a car chase! 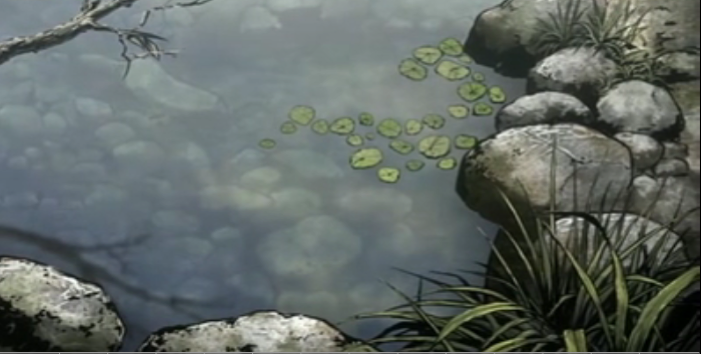 When Masa notices Matsu has gone missing, it is up to him and Ume to track Matsu down. This section was kind of like a cop show. They find out that Matsukichi is most likely being held at Otsu-ya (the rival candle shop), but how can they get inside to confirm? Of course! Masa goes to work there under cover. Heizaemon Yagi: Do you trust this man? Masa comes up with this plan on his own, and uses contacts through Yagi to get the job. Now Yaichi had already told Masa that he was worried about Yagi’s appearance. When Masa tried to introduce the two to each other, Yaichi walked away without saying a word. Even Ume tries to warn Masa that his plan is reckless. Needless to say, Masa goes ahead with it anyways. I guess it gets a little cliche to call something the best episode yet, but this was truly one of my favorites so far. There was some cool stuff to look at. There were surprises that I didn’t see coming (almost everything that happened with Matsu). There was the inevitable event that I was dreading to see (Masa telling Yagi WAY TOO MUCH). There were amusing moments (like Ume and Masa confronting the kid). 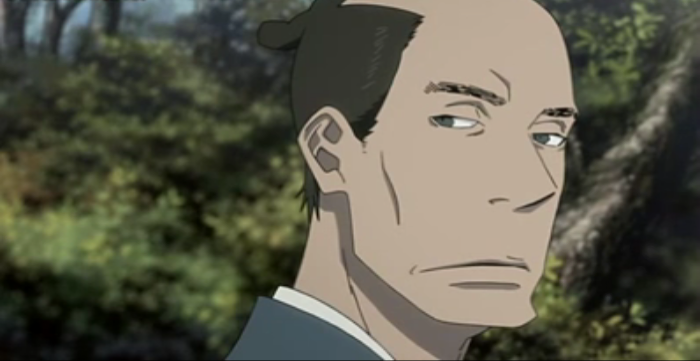 And there was even some indication of character growth (such as Ume getting over his attitude with Matsu). I’m loving this series.